Is evolution legal? - READY... SET... QUESTION! When it comes real data that can be collected today, the idea that evolution produces new and unique species cannot be observed, tested, replicated, nor verified. So, we must ask ourselves; is evolution legal? These evolutionists are not unique in their understanding of Darwin’s hypothesis. It is quite clear that the idea of evolution is based upon inferences that cannot be observed, tested, replicated, nor verified. No one has ever been able to produce empirical data that scientifically validates the emergence of species by means of natural selection. 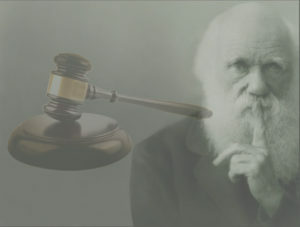 The fact that biological evolution cannot be observed, tested, replicated, nor verified, and the fact that biologists do not scientifically understand “how” evolutionary change takes place, puts Darwin’s hypothesis in a legal predicament. In the 2005 Supreme Court case Kitzmiller versus the Dover area school district, Robert T. Pennock stated that as a science-focused community we must “seek explanations in the world around us based upon what we can observe, test, replicate, and verify.” Ultimately, this case showed Intelligent Design to be unfit for the public classroom on the basis of it not being able to be scientifically observed, tested, replicated, nor verified. According to legal precedent, evolution is unfit for the public classroom due to the fact that biologist cannot explain the “how” of evolution. It is also unfit because the main result of evolution is unable to be observed, tested, replicated, and verified. Evolution is not legal science and is therefore unfit for the public classroom. In addition, there are two more reasons why evolution is being taught illegally in our nation’s public classrooms. Those who find themselves as subscribers of evolutionary thought believe the emergence of new species by means of natural selection to be true even though it cannot be observed. They believe that somehow, and given millions of years, new species emerged. Yet, if the core aspect of evolution cannot be observed and is included in the required curriculum, our civil liberties are being infringed upon. Webster defines supernatural as being part “of or relating to an order of existence beyond the visible observable universe.” If science cannot observe it, test it, replicate it, nor verify it… than it is outside of the natural world and therefore supernatural. Why are supernatural explanations being taught as fact in public classrooms? The belief that new species emerge by means of natural selection can only come through the supernatural and unobservable power of millions of years. Evolutionist, Richard Dawkins, has stated that we “need to define religion as belief in something supernatural.” So then, why is the religion of evolution being taught in our public classrooms? On December 15, 1791 the Establishment Clause was added as part of the first Amendment to the United States Constitution which clearly states “Congress shall make no law respecting an establishment of religion, or prohibiting the free exercise thereof.” If teaching evolution promotes faith in the supernatural phenomenon of the emergence of new species, it cannot be legally included in the US public school required curriculum. If educators in the field of evolutionary biology are keen on “loosening the grip of faith on America,” they have the right to do so, but not with public funds. Evolution is undergirded by a clear and honest agenda of the eradication of evolution-opposing faiths. Its publicly funded and required evolutionary curriculum is unconstitutional. The governmental backing of biological evolution is a crime. Until the day comes when evolution’s goal shifts from getting people to reject evolution-opposing faith, can show evolution to be true without having to believe in the unobservable and supernatural power of millions of years, and can scientifically show the emergence of new species by means of natural selection… then we must stop using public funds to support evolutionary education. Someday the scientific minds of this world will be released from the chains of evolutionary pseudoscience and be able to embrace actual science, technological progress, innovation, and breakthrough. The science class of the future will ask successive generations to focus on the reality of issues facing mankind. Science educators will ask their students how to address hunger, gridlock, energy sustainability, waste, medicine, water scarcity, and terrorism… just to name a few. Students will learn how to quench thirst with clean abundant water, offer speedy and efficient transportation, and end the pangs of hunger with smarter ways to farm. Adopting an approach of teaching how science works is far greater than teaching how to infer conclusions from a bias view of that which cannot be observed, tested, replicated, and verified. If the youth of today are taught to face problems and are asked to address such issues in the light of scientific progress and innovation, our nation will be in a position of continued and sustainable breakthrough… bringing wealth and prosperity for generations to come. Let’s make science the focus of our nation’s science classrooms! Previous PostDoes evolution take imagination?Next PostIs evolution scientifically valid?